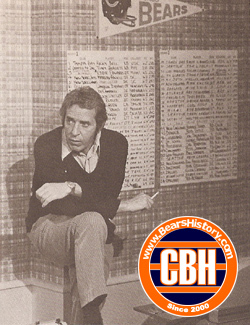 Bears' General Manager from 1975-1983. Turned Vikings, Bears and Saints from perennial losers to winners under his watch. Also served as GM of the Chicago Cubs for a time. Became first non-family member to run Bears organization when George "Mugs" Halas brought him on in 1975. Former Bear Doug Buffone said Finks "fired everyone from executives to the uniform guy" when he took over, including lovable coach Abe Gibron. Hired 38-year old Jack Pardee as his first coach and made Walter Payton his first draft pick. Built through the lines, solidifying the team in his first 7 seasons before pulling off one of the best draft classes in NFL history in 1983, before resigning from the Bears. Elected to the Pro Football Hall of Fame posthumously in 1995. Died in 1994 at the age of 66.